All my BEST gardening tips and tricks! I know that sometimes it's not easy to find things on this blog. I'm working on that, I promise! I just can't find a post organizing option that I like. In the meantime though, Spring has hit and as we are all starting our gardens (except those lucky people out in California that are already harvesting!) 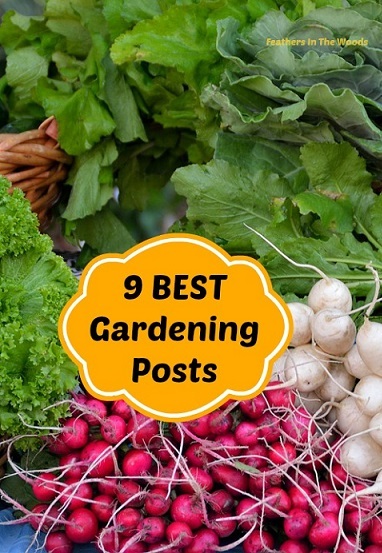 I thought I would round up a bunch of my gardening posts to make them easier to find. Growing herbs in pots and basil tips! Recycled mint planter...and why mint 'needs' a container! If you're on Pinterest I'd love if you followed my Gardening board.. I share all my posts and so many more. Follow Lisa @ Feathers In The Woods's board Gardening on Pinterest. I really enjoy gardening and have so many more posts planned! I just put in a new pea trellis made with all recycled materials. I also want to show you how I grew potatoes last year and why I'm doing it that way again. I want to talk about all the herbs I grow and why I chose each one. I have problems with deer eating my garden (those suckers jump right over the fence!) and would love to have an open discussion on wildlife management. I'm also working on some homemade items and have been doing a health experiment for several months and I'm ready to unveil my results! It's going to be such a great spring! Great posts! I was especially interested in the one about rabbits... they are WAY TOO comfortable in my yard and garden!!! Green beans, beets, peppers were all eaten down to the soil all last year by them... This year, we are doing better, but they are eating my pole beans. I did mix up some cayenne, black pepper and bone meal a couple of days ago... (I don't have any blood meal). So far, it seems to be working... if not, I will move on to your list. Thank you. Thanks for stopping by! I love your picture BTW! I enjoyed reading all these posts. I am learning every day. Don't try too hard! Good soil and a great location go a long way towards successful gardening! I notice sometimes the plants I fuss over the most tend to do the worst. Good luck with your garden this year! Thank you for sharing your tips with us at Brag About It! Such a great resource. I'm pinning so I can spend more time on all these great tips! I love gardening also. Great idea to round up a bunch of your posts. I haven't figured out a good way for people to access my posts either. Thanks for sharing with SYC. Great tips! Thanks for joining Home Sweet Home! Ooooh, so many wonderful posts to look forward to! Thanks for sharing. Thank you so much for growing with us on the CLIMB! PS - I hope that you will link up again this month - have a great day!